A central focus of the work of the modelling department is on the investigation of the impact of the atmospheric distribution and optical properties of absorbing aerosol particles (Saharan dust and carbon-containing aerosol) on the radiation budget and atmospheric dynamics over Europe, North Africa, and the tropical North Atlantic. The aerosol emission and transport is simulated using the regional transport model system COSMO-MUSCAT. 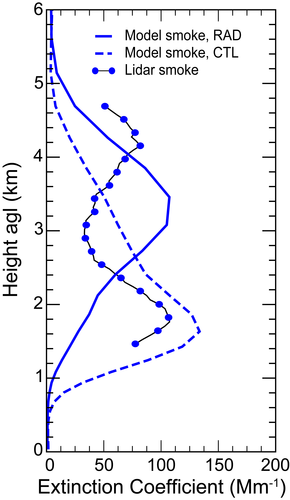 The model allows online interaction of the predicted aerosol load with the computation of solar and terrestrial radiation fluxes and the model dynamics. This way, the influence of aerosol particles by modifying the radiation budget on temperature, wind fields, and cloud dynamics can be investigated. As an example, the direct radiative effect and dynamic atmospheric response due to Saharan dust and biomass-burning aerosol particles (mainly soot) is presented for a 14-day case study during the second field campaign of the Saharan Mineral Dust Experiment (SAMUM-2) at Cape Verde in 2008. For the simulation of dust and biomass-burning smoke, COSMO-MUSCAT was used. The dust optical properties in the model were chosen in accordance with the SAMUM field observations in Morocco 2006. 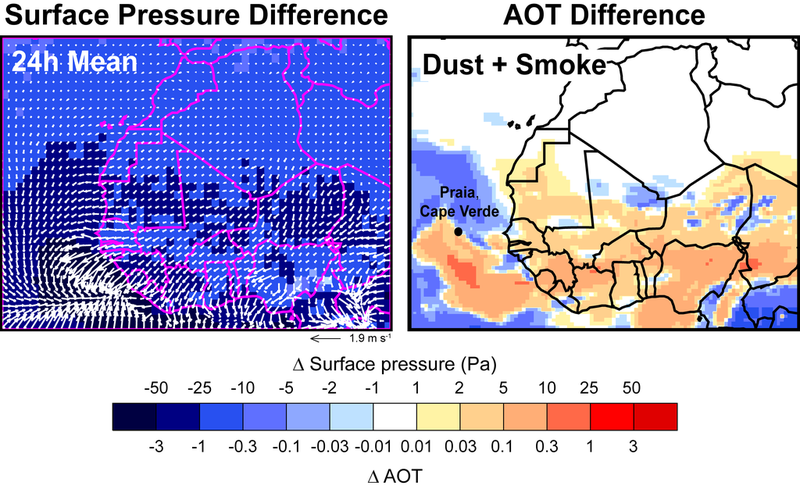 For biomass burning particles, high values of absorption were assumed as found for freshly emitted smoke particles from African savannah fires. Dust and smoke particles influence the atmospheric dynamics by changing the radiative heating rates. Local and synoptic scale airflow patterns are modified by the associated pressure perturbations. As a result, the radiative feedback simulations show an enhanced Hadley circulation and convergence zones along the West African (Guinea) coast. The smoke particles spread more than 5° further north and the equatorward transport is reduced compared to a model run without radiatively active aerosol particles. Within the convergence zones, Saharan dust and biomass-burning material are more effectively transported towards the Cape Verdes. Given the model uncertainties, the agreement between the modelled and observed aerosol distribution is locally improved when aerosol–radiation interaction is considered. For more details see Heinold et al. (2011). Heinold et al. (2011) Heinold, B., I. Tegen, S. Bauer, and M. Wendisch (2011), Regional modelling of Saharan dust and biomass burning smoke Part 2: Direct radiative forcing and atmospheric, Tellus B, 63(4 (Special Issue)), 800-813, doi: 10.1111/j.1600-0889.2011.00574.x. Fig. 2: Vertical profiles of biomass-burning aerosol extinction at the Cape Verde site on 31 January 2008. 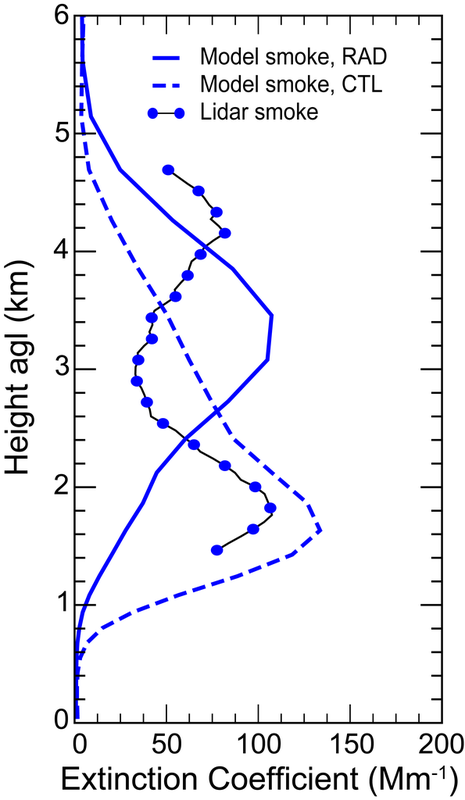 Comparison between the modelled profiles from the simulation with (blue solid line) and without (blue dashed line) radiative feedback with lidar data (black line with blue circles).